I’ve seen different reactions to Walt’s phone call to Skyler. Some say it was all a ploy to save her from prosecution; others says that it was real and he was railing at her. Does the debate surprise you? Walley-Beckett: I personally feel like it wasn’t open to interpretation. I would hope that people got that it was an absolute ploy on Walt’s part. It is the family-man part of Walt playing the part of Heisenberg to exonerate Skyler. I was hoping that the process of the lie and the subterfuge would be clear and that viewers would be with Skyler in their understanding. When we first hear Walt, we think he’s gone full Heisenberg. It’s outrageous and horrible and abusive what he’s saying! But then we start to put the pieces together as Skyler does, and I was hoping people would sort of be traveling that journey with her. Johnson: I had two angles on Skyler, and one of them was the side angle. I purposely turned that up to try and keep everybody in the room — the cops, Marie, Walt Jr. — present, and then I had a more intimate, straight-on camera for her. So much of her reaction to the call is about not just what she’s going through inside, but about how she plays it, how she plays along with the lie, or doesn’t. That was really important. Then Bryan’s side was a much different challenge. The complexity of it, playing one thing while feeling another, that’s always interesting to watch. The fact that the Heisenberg personality, which throughout so much of the show has liberated him to do these horrible things with impunity, has become this thing that he’s now imprisoned by. He has to put this persona on to do the thing that he never wanted to have to do, in order to save the family that he’s already lost. At the same time, he’s venting old Walt’s real frustrations. Walley-Beckett: Yeah, in the writing of it and the breaking of it we talk a lot about the line between truth and fiction. There are things in there that are truth, but it’s all subterfuge. It’s a very fine line. The most emotional and devastating moment for me was when Walt Jr. watched his parents fight. Was it technical to shoot? Johnson: As opposed to watching Bryan do one long take on the phone where you’re just swept up in the emotion, the fight was more of a technical endeavor, making sure it came across as violent while everyone was safe. I think it speaks more to the actors, the emotion that got all through that technical stuff. Walley-Beckett: There was a lot of choreography. Both Bryan and Anna wanted to do everything themselves, and they worked it out with Rian. Rian, as he always does, had all his shots mapped out exactly how he wanted to see [them] and pieced together the violent moments of the fight. It’s really watching Bryan and Anna at the top of their craft and hitting their marks, not hurting each other, not getting so lost in the moment technically but still bringing the performance. It was just stunning. It was such a feat. Johnson: Yeah, where you think someone might get a knife to the stomach during the course of it. I should say Bryan and Anna did the majority of it but there were two shots where two very talented stunt people took the fall down onto the ground. When Walt Jr. throws himself in there to protect Skyler, I held my breath. Walley-Beckett: Oh my god. Can I tell you how much [R.J. Mitte] enjoyed doing that? [laughs] He’s, like, action guy! I mean, as a person, as an actor, he was very excited to get to do that. As Walt Jr. it was devastating. Rian, you also directed “Fifty-One,” which had another huge Walt and Skyler confrontation. (She tells him she’s waiting for the cancer to kill him.) It takes place just months before this fight. Can you talk about directing both these turning points? Johnson: Yeah, it was really, really nice coming in to this one, with all that happens in it, to already have a relationship with Bryan and Anna, and to already have a certain comfort level and knowledge of how they work. They are very different actors in terms of their process, but they work so well together. It was nice having gone through the crucible — [laughs] I don’t know if you go through a crucible — but having shot that scene in the bedroom. For me, it was a trial by fire before paying a lot of that stuff off in this episode. It was nice to see it come full circle. Both of those guys, they’re just two of my favorite actors in the whole world. Just tremendous. Walley-Beckett: Yeah, I have to say it was so satisfying to me and so satisfying for Anna to get to have that moment where Walt is just expecting to win and talk his way out of it like he always does, and to have her get to say, “Enough. Don’t say one more word.” Anna and I talked about that in the writing and in that moment and it was just really exciting. Did she read it a variety of ways? Walley-Beckett: Well, Anna knows her character really well and there was never … I don’t recall, Rian, that she tried a lot of different things. She knew exactly that mama bear threat that she wanted to bring. Johnson: Especially in protecting her kids, I think, is something she just snaps right into and has a very deep well to draw from. She knew exactly emotionally where she was gonna be in that moment. Dean Norris said you got Hank’s death in one take. Johnson: Did Dean say that? Johnson: We did a couple of practice takes then. Walley-Beckett: Dean took it like a man. Johnson: Because the location we were shooting in was in a valley, we actually had a really limited amount of daylight every single day. So on top of being very emotional, those scenes were also really jam-packed and rushed. And if you watch Dean when he’s on the ground in those shots, you’ll see him squinting, and if you look, you can see dust blowing, and it doesn’t really communicate how horrible a dust storm was happening [laughs]. Walley-Beckett: It was horrible. No one could breathe or see. The crew, we all had bandanas over our faces and sunglasses on. But the actors are just doing the scene, and it was so intense. Johnson: And, it wasn’t much more than one take. Honestly, it was maybe a couple takes. Like with Anna, I think Dean had been wildly prepared for this. He knew where he was gonna be with this, and the amount of dignity and complexity he gave those moments, he showed up with that. That was just another thing I felt really privileged to watch happen. Having the camera looking up to Uncle Jack from the ground made me so anxious. I had to re-watch it because I’d covered my eyes for most of the scene the first time. Walley-Beckett: That’s good! But I’m sorry you were uncomfortable. Only for the entire episode. There were a couple of reaction shots of Todd. In his own psychopathic way, does he feel bad about what happened to Hank? He looked a little less indifferent than usual. Walley-Beckett: Within his distinct lack of empathy, he does respect Mr. White, and he’s very much aware of the plight of Mr. White. And I think it just makes Todd kind of uncomfortable to see Mr. White cringing and weeping on the ground. It’s hard for Todd to assimilate that kind of information. Johnson: It’s like seeing your teacher or your parent cry or something. There’s just something uncomfortable about it. Walley-Beckett: I think Todd just feels … unsettled [laughs]. Why does Walt reveal that he let Jane die? Walley-Beckett: It’s a prolonged death sentence for Jesse. Walt gave the nod for them to shoot him in the head and it would have been the end of it. That’s pretty powerful in and of itself. Jesse is no longer family. But he gets a short stay of execution because Todd makes a very good point, and so basically it’s clear Jesse’s gonna go and have an excruciating last day or two before he’s killed, and Walt is twisting the knife. It’s the last thing he can say or do to kill Jesse himself without actually physically killing him. You both worked on the episode “Fly” as well (Johnson directing, Walley-Beckett co-writing), in which Walt almost told Jesse the truth about Jane. Now, you got to realize the moment. Walley-Beckett: I was really excited to get to have part A and part B. We had the dance up to it, and that horrible, horrible moment of anticipating that Walt was gonna spill it in “Fly,” and this time it comes out of the blue. And it’s just cruel. At first you think Walt is almost going to offer an apology. It did look like he was sorry for a split second! Walley-Beckett: Right? But no. That is pure Heisenberg and, truly, his murder of Jesse. He just kills his spirit. Johnson: That was such a huge moment in “Fly.” I’m also really grateful that I got to work with Moira on these specific episodes because the place Walt was in when he was about to spill it the first time, he was going to spill it out of feeling bad, out of feeling terrible about it. The fact that when he does actually spill it it’s from such the opposite place, it was incredible to see that arc play out between these two very different episodes. Moira, did you write dialogue for baby Holly? Did the script really say: “HOLLY: [cries] Mama! Mama!“? Because that baby delivered. Walley-Beckett: We got very, very lucky, didn’t we Rian? We got lucky because that was a shaky moment for the baby. It’s a stressful situation for little kids. It was not scripted. She was looking at her mom off-stage and started saying that at the exact moment where it is scripted that Walt has a pang that this is morally reprehensible to do this to his daughter, to deprive her of a normal life. And this little baby just started looking at mom and we just rolled. Johnson: The baby’s mom was like three feet away, right next to the camera. The baby was not actually screaming for her mother. As scripted it was just going to be this beautiful powerful moment where Walt looks at her. He brings her up to eye level and looks into her eyes and has that realization. I remember we were gathered around the monitor and he raises her and up and she started saying “mama,” and we all just looked at each other. Walley-Beckett: Rian just let it roll, and Bryan went with it. Johnson: That’s the other thing. In that situation, Bryan is really the one doing the directing because the way that he shapes the performance between himself and the baby is really about the way he handles her and plays off of her. In terms of emotional beats of that scene it’s really Bryan who is doing the directing there. He did a fantastic job. They both did. The way she ducked into her seat in the fire truck? Amazing. Johnson: It had been a long day for baby Holly. Rian, you tweeted that the last scene ever shot was the episode’s opening, the flashback in the trailer. Did you come back after they wrapped the finale to do that? Johnson: Yeah, we wrapped on this episode and then a month later, Moira and I came back for one day of shooting. We went back out to the desert, Bryan shaved his beard, Aaron shaved, we got them in their old duds. It was the most incredible, God, it was an amazing day, to get to be there not only for the last day of shooting, but in that RV with the guys looking like they did in the pilot … Moira, I can’t imagine how that must have felt for you? Walley-Beckett: To get to go back to the beginning, it was so powerfully nostalgic for all of us. Some of the crew had been there since the beginning too. It’s been so heavy these last couple of seasons with very, very few moments of levity or ease. To have the very last day of series filming take place back in the days of good old Mr. White and idiot Jesse, the two actors, it was so fantastic to even write that scene! It was so fantastic for all of us to go back in time and be there at the beginning before everything went so wrong. There was this very uplifting feeling amid the bittersweet end to the whole thing. Did you intentionally want to film that last? Johnson: No, it was all hair and makeup issues. Johnson: If we had shot that early, Bryan would have had to wear a fake beard for the rest of the run and that didn’t seem like a good idea. 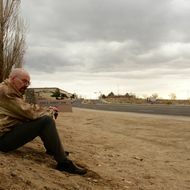 Vince Gilligan has said a few times now that “Ozymandias” is the best episode of the entire series. How was it decided who would write it, and was there any extra pressure? It has the highest stakes. Walley-Beckett: The roster for writing is actually decided well in advance, and then the stories break organically. So we know we’re assigned to script episode two or four or six or whatever it may be, but at the time we’re assigned we don’t know what the story is gonna be or what plot points are going to occur yet. For me, to get these plot points, this maelstrom, was just luck of the draw. I knew the enormity of it as we started to break it and we were coming up with all this stuff that was going to happen in my episode. I absolutely felt the weight of it, and the excitement to get to write this stuff. The process goes you write an outline first, and on Breaking Bad those are like little novellas, fifteen to twenty pages of the story of the episode. You turn it in and then you get about ten days to write your episode and you just go away and do it. It’s intense. What was the most challenging thing to get right in the episode? Walley-Beckett: Walt’s speech was really a challenge, how to lay the track for the subterfuge for the lie, finding all the beats for when you think Walt just slipped and become a Heisenbergian monster on the phone, to dropping in the little moments of Skyler’s rage and indignation, and the process of the lie, and Skyler’s acceptance of the lie. That was a really tricky scene to write. But it was all kind of tricky because it was so fraught emotionally. There wasn’t any downtime in this episode.